Struffoli di Mamma are puffy balls of fried dough which are crispy on the outside, light and airy on the inside. 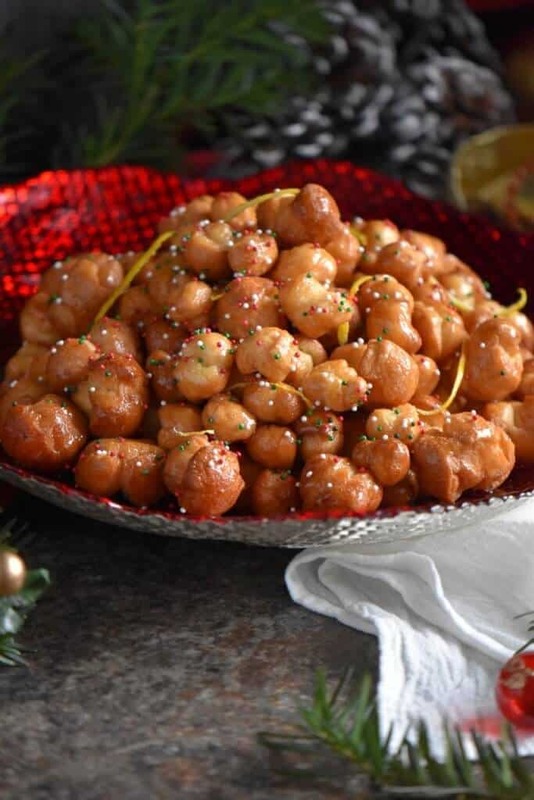 These Italian honey balls (aka Cicerchiata) are then drenched in citrus scented warm honey and decorated with sprinkles. The perfect addition to your platter of Italian Christmas cookies! This recipe was originally published on December 3, 2014 and republished on December 3, 2017 with updated content, photos and recently with a video. Struffoli is just one of the well known Southern Italian (Neapolitan) specialty desserts. Mostaccioli and Chiacchiere are two other Italian desserts originating from the Campania region of Italy. All are perfectly suited for the festive holiday season. According to folklore, struffoli are supposed to bring good luck since the spherical balls of dough are a symbol of abundance. As is usually the case with regional Italian cooking and baking, there are different names associated with this Italian specialty. If you were in Sicily, this confection would be referred to as Pignolata. In Abruzzo, they would be referred to as cicerchiata. No matter what name they are called, one thing is for sure, they are a special treat. I would like to suggest that we work the dough manually. So you are going to need a wooden board and some elbow grease… are you ready? You can choose to make these Italian fritters with a stand mixer or the old fashioned way with a wooden board and a lot of elbow grease. Since the video (found in the recipe card) shows the method with the stand mixer, let me explain how these struffoli come together on a wooden board. The first thing we are going to do is make a mound and shape the flour into a well. Add the eggs in the center of the well and with the help of a fork (or your fingertips) start beating while slowly incorporating a little bit of the flour. Continue adding the ingredients, one by one, all the while incorporating the flour. I like to use my dough scraper in this process. Once the wet ingredients have been absorbed by the flour, start kneading. Almost magically, the dough becomes shiny and smooth. That is you cue that you are done. If you prefer, you can use your stand mixture with the hook attachment to make the dough for these struffoli. Wrap the struffoli dough in plastic wrap and allow to rest for at least one hour. Ideally the dough should be fried the same day it is made. However, it can also be refrigerated for 12-24 hours. With a knife or dough scraper, cut a piece of dough from your beautiful ball of dough; roll into a 1/2 inch rope and proceed to cut into 1/2 inch pieces. Roll each little piece of dough. Continue until all the dough has been formed this way. In a deep frying pan, heat the oil and fry the little balls of dough in batches, making sure to swirl them around in the oil. Just a few minutes is all it takes for them to swell and puff up. When they become golden brown in color, they are done. Transfer to a paper towel lined tray. Continue in this fashion until all of the dough has been fried. The final touches: Warming up the honey on low heat, just enough to make it runny, will facilitate shaping and coating the struffoli. The struffoil can be shaped into a large wreath or placed in individual muffin liners. I like to mound the little balls in a large bowl, simply sprinkled with some non-pareils and some lemon zest for garnish. 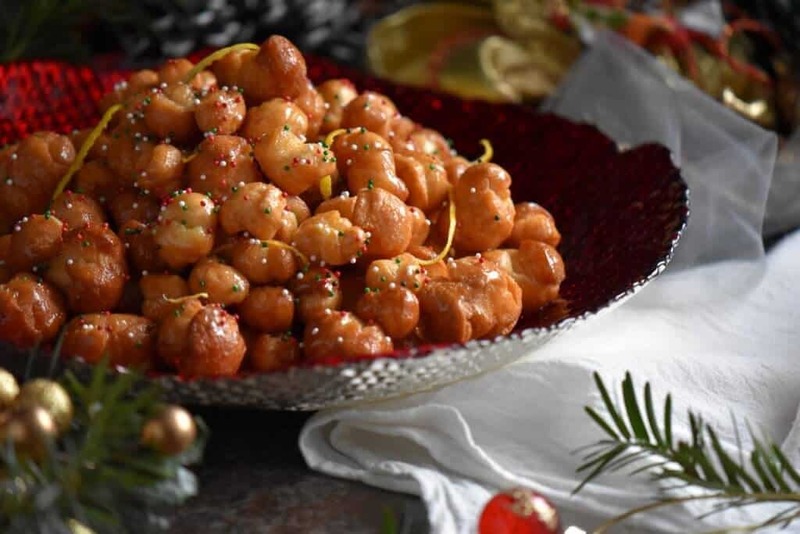 No matter what shape it takes or how you decorate it, these Struffoli di Mamma are sure to be a hit with family and friends! 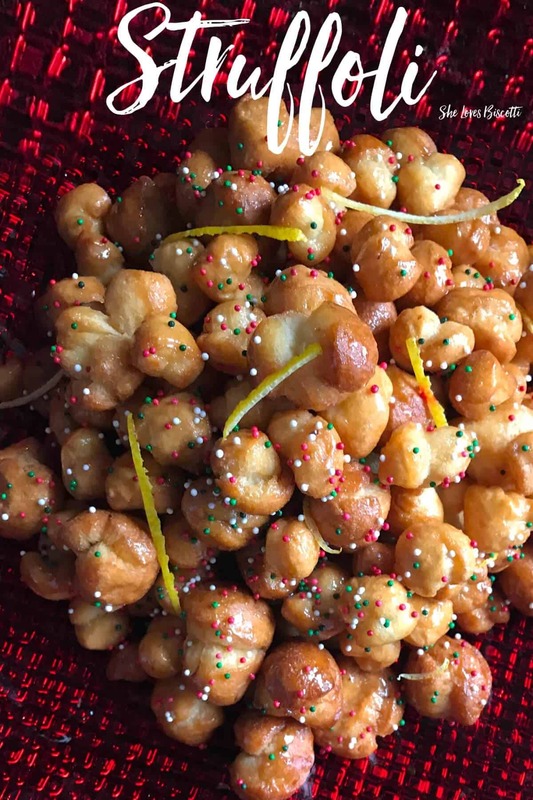 With a title like Struffoli di Mamma, you may have guessed that this was one of the many recipes my mom would make exclusively at Christmas. If you have been following along, you know that my mom was born in Molinare, Benevento. I can remember helping my mom roll up the little pieces of dough, just before they were ready to be fried. I couldn’t wait for Christmas day when this dessert would be brought out and placed in the center of the table, along with the Mostaccioli and the Calzoni di castagne. The kids, and some of the kids at heart 😉 , would gather round the table waiting for their favorite dessert to appear. My eyes were focused on the struffoli platter. I would always grab the ones at the bottom of the mound… that’s where all the honey had accumulated. Looking back, I think that was part of the Christmas magic… the anticipation that there would be so many wonderful meals and baked goods that were only made once a year. Couple that with the anticipation of spending time with cousins and the extended family and of course the men singing a cappella after a few glasses of homemade wine and grappa. No iphones to capture those priceless moments but the memories are vivid in my mind. The capacity of these memories to be triggered by a scent or taste is one of the reasons that I continue to make and document so many of these “family” recipes. I hope that these recipes will also revive some of the wonderful memories that you have, and equally if not more important, creating new memories for the next generation. Would love to hear some of your food memories! 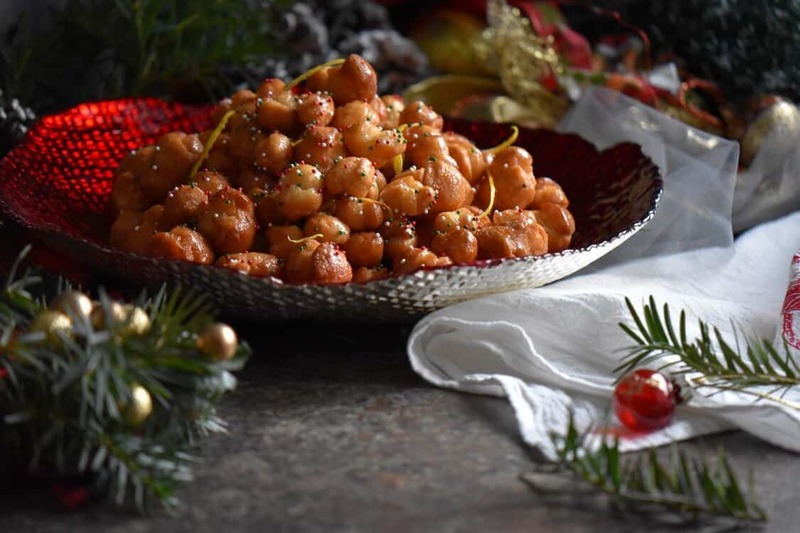 ★★★★★ If you have made this recipe for Italian Honey Balls, I would love to hear about it in the comments below and be sure to rate the recipe! Struffoli di Mamma aka Italian Neapolitan honey balls are puffy balls of fried dough - crispy on the outside;light & airy on the inside, drenched in honey. Place flour on a wooden board. Shape into a well (basically form the flour into a wreath shape). Place the ingredients, one by one, in the center of your well, while whisking with a fork. Continue to whisk while slowly incorporating the flour. Keep incorporating and kneading the dough. I find a dough scraper helps with this whole process. When the dough comes together, knead for about 10 minutes until shiny and smooth. Wrap dough in plastic wrap and allow to rest at room temperature for at least one hour. In a large pot or electric fryer, preheat vegetable oil to 375° F - 400° F.
Line a large tray with paper towel. Place dough on cutting board. Cut dough in strips. Roll each strip into strands about 1/2 inch in diameter. Cut each strip in 1/2 inch pieces. Drop about 10-15 pieces of dough into hot oil at a time. Swirl pieces of dough until golden. Place struffoli in a mixing bowl. Set aside. Alternately, you can use your stand mixer fitted with the dough hook to knead the dough. 1 portion is about 5 struffoli. Can be shaped in a wreath or portioned in festive muffin liners. IF YOU ENJOYED THIS ITALIAN HONEY BALLS RECIPE, SAVE IT FOR LATER. PIN IT TO YOUR ITALIAN BOARD! I remember Mom making these for a few days. She was like Oprah, you get a struffoli tray and you get a struffoli tray..My dad also helped by shaping them. He made some shaped like ribbons. Then when I got older I helped her cut and roll them. Bring back such fond memories. It never seizes to amaze me how much energy our moms had… never thinking of themselves… family first -all the time. I adore these. My mother makes them at Christmas in a wreath shape. My family are from Molise and moved to Australia in the late 40’s early 50’s. My grandmother, who we affectionately called Mammina, would make cicerchiata at Christmas and it was always my favourite. Whenever I see this recipe I think of her so I must try it. My sister-in-law’s mother still makes and it and I always hope she sends me a piece at Christmas! A good family friend was from Benevento and he introduced me to Strega. It’s my favourite liquor and when not drinking it I use it in my tiramisu. Thank you for the wonderful recipes, there are so many familiar ones from my childhood and I love trying them. An absolute memory trigger! 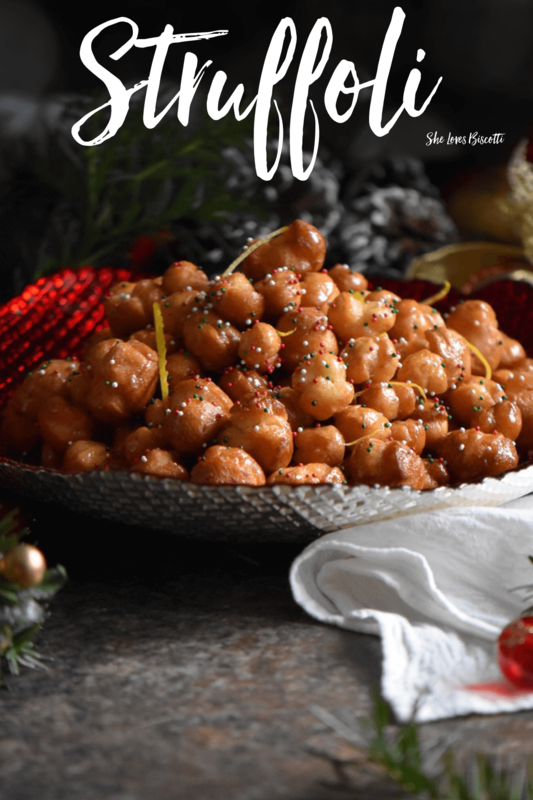 During the holiday period, we would sit at the kitchen table and pick one at a time entire the entire platter of struffoli disappeared, quite easy to do as I am sure you know. You recipe is a variation of the one my favorite Aunt used, I am going to try your version in a few weeks. By the way, I will be in Benevento in April and would appreciate any suggestions or tips Maria – you can email me. How wonderful Paula! You are going to love this little town… make space in your luggage because you are going to love the torrone of San Marco Dei Cavoti, definitely worth the detour! Here is a link in case you are not familiar with them: http://www.borrillo.it/ Will email you with other info. This is another recipe that I grew up with and would like to try it for Christmas. 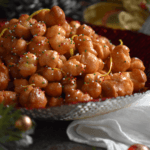 I remember the struffoli were shaped into a wreath and then we would cut into pieces. Does the honey have to be heated to a certain temperature so that it holds the balls together?? I’m also going to make the chickpea and honey fritters another recipe I grew up with and of course the zeppole that my kids adore. Thanks again for all your recipes and for giving me the confidence to attempt them!